If zombies are a big part of your life, then this is the perfect place to find all the zombie decor and zombie gifts to satisfy your hearts desire. 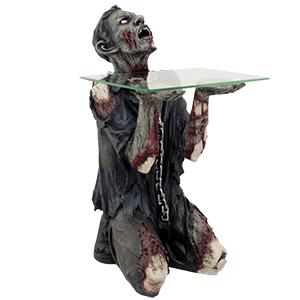 We carry excellent zombie decorations for Halloween or any other time of year, zombie collectibles inspired by The Walking Dead, zombie games, and many other gruesome and gory items that you are sure to love. 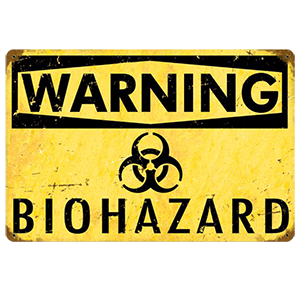 Check out our bloody body parts, fountains and misters, zombie statues, zombie POP figures, and zombie wall art to see a bare fraction of what we have available. Bloody candles and zombified garden gnomes are great for haunted houses, as are our zombies corpses that can be positioned to recreate scenes of classic horror. Our zombie giftware ranges from lighters and keychains to novelties like brain molds and bloody soap! There is something for everyone here in our zombie home decor and gifts category. The undead can certainly be messy eaters! Look at all these pieces they left behind. 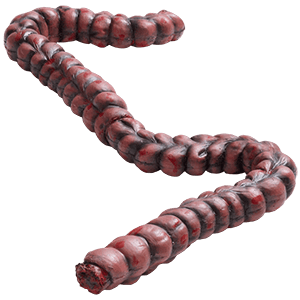 We carry a gory array of zombie body parts that can be used as props or decorations. Our butcher shop inventory includes bloody arms, chopped hands, severed fingers, decapitated heads, severed feet, bloody legs, zombie innards, and other gruesome pieces. Our zombie limbs, cut off heads, and removed organs come in designs that hang from the ceiling or are served up on trays. Drape some zombie intestines over your furniture, or add eerie light to a room with a color-changing brain. 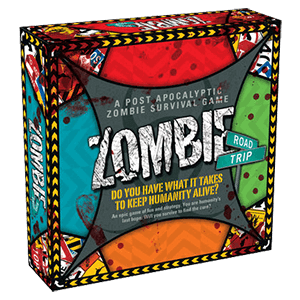 These zombie corpses and bits work great for Halloween parties, haunted houses, or playing pranks. Take a moment to browse our selection to find the perfect eerie accent for your needs. Show off your love of zombies to all of your friends with these fantastic pieces of zombie drinkware! If you feel like a member of the undead before you get your coffee in the morning, one of our zombie mugs is the perfect choice. Alternately, you can enjoy your favorite zombie cocktail with our zombie wine glasses and zombie goblets. Our zombie glass sets come in multiple fun designs for fans of the undead to enjoy. We carry a variety of zombie humor and sculpted zombie cups, some with stainless steel inserts to ensure that they can be used safely with consumables. 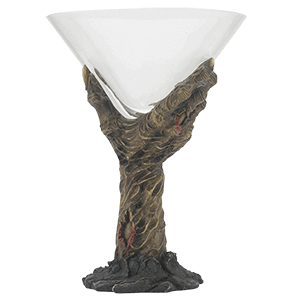 Take a moment to browse our selection of zombie drinking glasses to find the perfect piece for your table setting! Here in our zombie home decor category, you will find fantastic products for adding a creepy touch to your home, yard, or office. 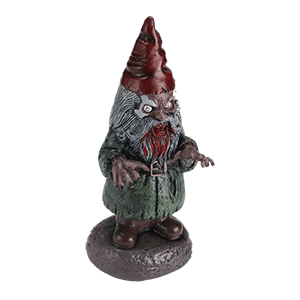 We carry an excellent array of zombie statues including undead garden gnomes, hands rising from the grave, decapitated heads, and eerie shelf sitters. Other zombie figurines take on a humorous note, depicting zombie cheerleaders, corpse brides, undead housewives, a zombie Lady Liberty, zombie prom couples, and more. Alternatively, you may enjoy our zombie door covers, body bags, warning tape, and door knockers to create spooky scenes for Halloween or haunted houses. Our other products extend to zombie incense burners, zombie bottle holders, zombie drink coasters, zombie end tables, zombie trinket boxes, zombie bookends, and zombie holiday ornaments. This constantly expanding category is sure to hold something that appeals to your sense of the macabre! 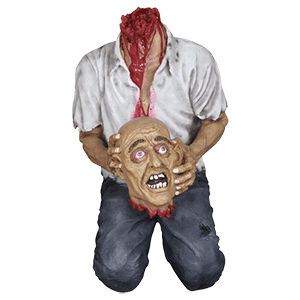 Whenever you are looking for something truly ghoulish to decorate your home or make a part of your undead costume, look no further than our zombie props category. Here you will find zombie puppets, mad scientist kits, doctor bags, lanterns, and other useful items for a wide range of creepy costumes. For the exterior of your home, we offer other pieces like groundbreaker zombies, zombie yard stakes, zombie tree huggers, hanging zombies, spinning zombies, and other outdoor ornaments to transform your abode into a spooky house of horrors. Scare your guests with ghoulish bats, toads, serpents, and vultures, or warn away intruders with butcher signs and caution signs. Some of the Halloween props are animatronic, while others stand still. These horror props are made from materials like plastic, latex, resin, and foam. All of them are incredibly detailed to earn as many shrieks and shudders as possible. Whenever you are decorating inside and out, turn to the zombie props section here to fill all your zombified needs. Bring a bit of the undead into your own domain with our zombie statues and figurines! We offer an assortment of zombie statues and figures that range from gratuitously gory to funny and tongue-in-cheek in their depictions of the undead. Shop here as well for all our collectible zombie POP figures, zombie bobbleheads, and zombie miniatures, too. Check out licensed figures from The Walking Dead, iZombie, Resident Evil, and more here. Whether you are a collector of zombie goods, shopping for a gift for a friend, or simply seeking something delightfully undead to add an extra touch of eeriness to your home or office, our zombie statues and figurines section is the place to find your next gory decor piece.